We can use VBA to Copy a Range to another location or range. 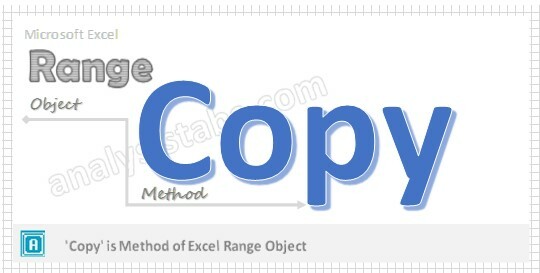 Range.Copy method will copy and it will save the copied data in Clipboard then you can select any range and paste. You can also specify the destination range while copying a range. Here is the syntax to copy a range using VBA. Here, Destination is the range which you want to be copied. This is optional, you are not providing the destination range, this will copy to the Clipboard. Here is the simple example to copy a range. In this example , we are copying Range “A2:D10” to the Clipboard and then Pasting in the Range “E2”. Here is the another example to copy a range to specific range. In this example , we are copying Range “A2:D10” and pasting at Range “E2”. You can follow the below steps to execute the macro for copying a range using VBA. Enter some data in any cells in range “A2:D10″ to test this macro. Now you can observe that the Range A2:D10 is copied to specific range. This will copy the range including its formats and other elements in that particular range. To copy the specific elements, see the examples on PaseSpecial. How do I copy a local 2 dimensional array of data to spreadsheet? Here is the code for the above question. How do I copy the contents of a range over without changing the formatting of the range that I am pasting to? Starting a new reporting month. I want to retain info for the last 12 months, hence I want to remove the oldest month and all the data in its column and add a new month at the end of my range. However, when I “move” (by copy and pasting using a VBA command), I want to paste the values only, not the formatting.